So the Mets are trying to address a ghastly bullpen and today announced they’d signed Neil Ramirez to a contract and he’ll be in uniform tonight — No. 55 — as they face Arizona. The extent to which Neil Ramirez can be the “answer” is a matter of some debate — he’s been released by two clubs already this year and has yet to match a short stretch of success he had as a Cubs rookie a few years back — but I’d agree it’s time to do something. This bullpen in particular is churning up memories of 2008 when similarly disappointing returnees and a merry-go-round of cheap acquirees (Luis Ayala, Brandon Knight, Tony Armas, Scott Schoeneweis, and so on) seemed basically infected with a strain of lost confidence. 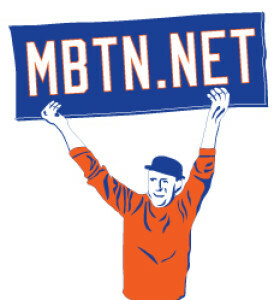 And while the bullpen pitchers are ultimately at fault, some of the blame needs to go to old Terry, whose use of the pen reeks of his lack of confidence in some guys and over-confidence (and overuse) among others; and to the rotation, whose poor efforts require more help than the club has been able to offer (and who repeatedly commit the sin of giving back every run the club scores as soon as possible); and to the offense, who, especially early on, made every game a do-or-die bullpen situation by failing to support the starters or give them any breathing room. Good teams simply cannot allow themselves to have their fates determined by 12th or 13th best pitcher on them (or the best relievers working to protect 5-run leads) and the way to do that is to make better starts and hit the ball harder. It could be, the best move for the bullpen would be to turn Curtis Granderson and Jose Reyes into pinch hitters; get Robert Gsellman two weeks of starts in Las Vegas and got get Zimmo and Cecchini already. But for now, the best move is Neil Rodriguez. So Tim Redding showed up today at CitiField and received a pinstriped Mets jersey with his name and No. 44 on the back. Interesting in that it makes three Mets on the current 40-man roster who have a claim to that jersey, even though its not likely two of pretenders, Eddie Kunz or Brandon Knight, make it back right away. But a small part of us will be rooting for Knight, who is on the fast-track to McKnighthood having already burned though two numbers in just four appearances and is now poised for a third. Knight you may recall arrived from Class AAA in late July to take a start in place of Pedro Martinez who was away on bereavement leave. (That game eventually turned into the stupid, 10-8, 14-inning loss remembered for Albert Pujols’ home run off Aaron Heilman). Knight was wearing No. 28 then. He shortly was back to New Orleans and then to the Olympics, and by the time he’d returned in September, Daniel Murphy was a sensation in the same No. 28 jersey and Kunz had made a brief appearance in No. 44, which was subsequently assigned to Knight. 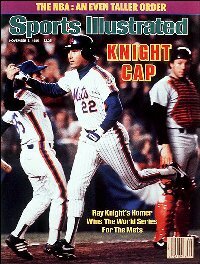 Mets rosters though today continue to list Knight as the possessor of 44, with Redding and Kunz listed as the everpopular —. Thanks to astute reader Rich for pointing that out. And thanks to our friends at No No-Hitters for the assist on the new uni-number graphics, which look a million times better than the old ones wouldn’t you say? Brandon Knight is set to start for the Mets Saturday night as the replacement for Pedro Martinez, who was placed on the bereavement list following the death of his father. Knight, who will dress in No. 28, will have come a long way from the independent Atlantic League, where he began the year, and is six years removed from his last big-league appearance, with the Yankees in 2002. The limits of the bereavement list (maximum of 7 days) and the upcoming Olympics in Bejing, where Knight is scheduled to represent the US of A and manager Davey Johnson, figure to make this a brief visit, but let’s hope a successful oine. Sandy Alomar Jr. — as a player — most recently wore the 28 jersey,obtaining it in a swap for No. 19 with teammate Jeff Conine last season. (Can you believe either of those guys finished their careers as Mets?) The uni had previously belonged to stylish reliever Juan Padilla (goggles, magic tricks, invariably took off his hat at the end of an inning). Padilla, who’d been rehabbing various arm ailments since a promising showing in 2005, was quietly released by the organization this month. That same crappy feeling I got when Robin Ventura joined the Yankees returned tonight when I learned the Bombers had traded for Pittsburgh’s Xavier Nady. I don’t want to see the guy fail but playing up to his abilities in Yankee Stadium’s left field ought to be worth a few laughs before the season’s over, and I wouldn’t bet big on his continuing to run a 900+ OPS, even if I won’t actively root against it.